Hazel Park nurses April DeBoer, left and Jayne Rowse, kiss 2-year-old Rylee DeBoer-Rowse during Michigan Adoption Day at the Oakland County Court House in Pontiac, Mich., Tuesday, Nov. 25, 2014. 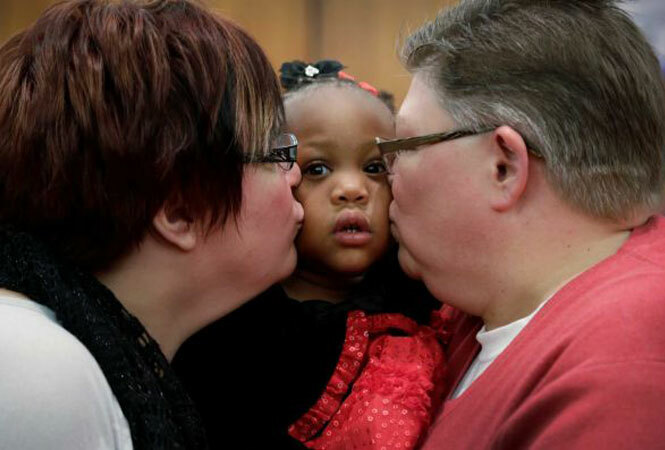 The Detroit-area nurses, who are challenging Michigan’s ban on gay marriage, finalized their adoption of Rylee, their fourth adopted child. 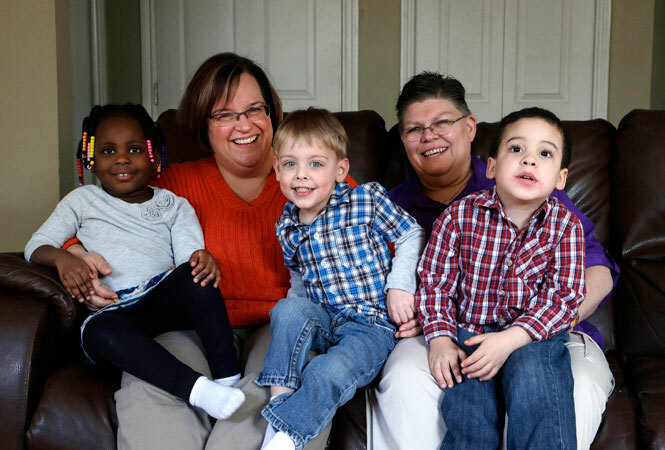 HAZEL PARK, Mich. — Two Detroit-area nurses who are challenging Michigan’s ban on gay marriage are raising a fourth adopted child. The adoption of 2-year-old Rylee DeBoer-Rowse became final in Oakland County on Tuesday, a day when adoptions were publicly celebrated across Michigan. April DeBoer and Jayne Rowse with their other three children at their home in Hazel Park, Mich. The couple adopted a fourth child on Tuesday, Nov. 25. April DeBoer and Jayne Rowse are raising three more children in Hazel Park, but Michigan law bars them from jointly adopting the kids because they’re not married. They objected to that law in 2012 in a groundbreaking lawsuit that eventually grew into a major challenge to the state’s ban on gay marriage. DeBoer, 43, has adopted Rylee and two other children. Rowse, 50, has adopted one. “I’ve had a chance to follow the love you feel for your entire family,” Oakland County Judge Lisa Gorcyca told them. Even the attorney general’s office, which is defending Michigan’s ban on gay marriage, has said Rowse and DeBoer are excellent parents. Voters in 2004 recognized marriage only as between a man and a woman. A federal judge last March overturned that amendment to the state’s constitution, but an appeals court recently reinstated it and also upheld anti-gay marriage laws in Kentucky, Ohio and Tennessee. The U.S. Supreme Court is considering appeals from Michigan and other states. The Michigan case could be attractive to the court because it went through a full-blown trial.